Baiko Arashi wrote: yeah gan ning was great but i have a strange feeling i've seen that picture somewhere before. You probably have, I used the Gan Ning San Comic strip as a reference. Hopefully, with some intensive practice, I should be able to sketch some San Comic-esque stuff without a reference. Look out Peng, I'm after your job! RocketPower wrote: Wow! Your much better att drawing then me..... The Gan Ning picture was pretty good, but I like Lu Su better. Yeah, I like the Lu Su one more also. It was far simpler to draw, but the guy is just hilarity personified, imo. Ooh, I haven't posted anything here for ages...well, I've lost my muse you see...can't find her anywhere. I'm in the process of finding some suitable G1 Transformers references to sketch, should be fun. I was a dab hand at drawing TF's (and GI Joe peeps) when I was younger, so it shouldn't be tooooo difficult to pick up where I left off. Haha, great Gan Ning pic. That was awesome. Ricky wrote: Haha, great Gan Ning pic. That was awesome. I vow to produce more sketches soon once I get some decent leisure time at my disposal. Well the pretentious poetic musings fizzled out long ago, but I've been designing tattoo's for friends as well as trying to bulk up my portfolio for mah 'business venture plans', I'll upload a few later this week when I have some time. Long time no see, buddy. Looking forward to seeing your designs. How've you been? PARROT!! How the devil are you, my ol' weirdo-in-arms?? Where were we? Aye, the designs, I'll whack 'em on later this week probably. Ok, a slight detour from my previous, uh, 'artistic endeavours'...I've been messing about on Photoshop for a year or so now, I'm still very much at the Intermediate stage technically, however self-teaching via trial and error seems to serve me quite well! This is an artistic composition, comprised of manipulated images and an altered background image; a friend of mine requested it for his small business, since he's naff at Photoshop...the brief was: "Well, y'know, something different...loads of various stuff on a pretty background, easy enough..."
This was meant to be the header/banner of a website I was creating, for the production, order and sale of reproduced TF boxes. But uh, yeeeeeah, I discovered that Hasbro frown heavily upon such endeavours...pfft. 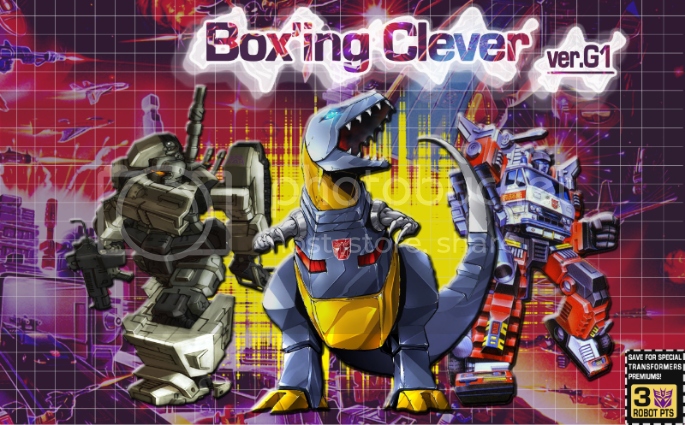 'Boxing Clever', see, t'was a good bloody website name for the purpose. I do wonder if Monsieur Nutcase is still floating aboot...er, about...his lunacy was indeed magnificent, back in the day. Also, new photoshop creations to post soon, when I can recall my photobucket login.